DESCRIPTION: Wing length 6mm. 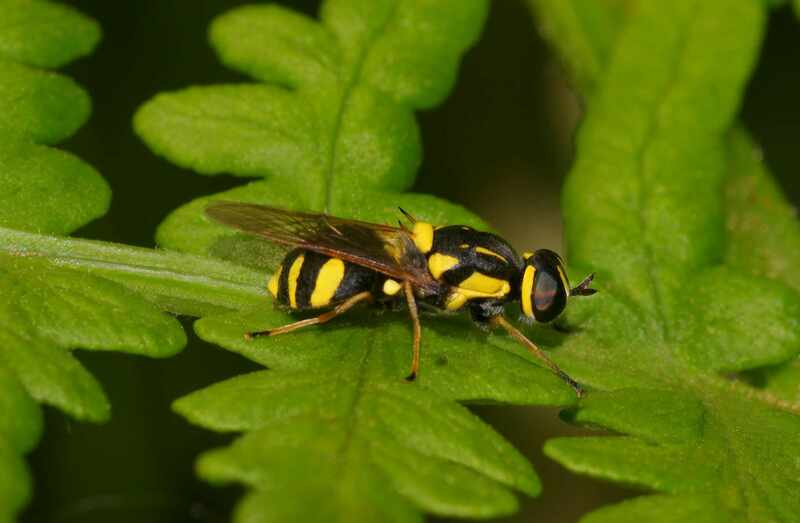 An eye-catching Soldierfly attired in a striking combination of yellow and black. The key identification points are the completely black tergite 2, the large yellow side spot on the thorax, the yellow humeri, the 2 spines on the scutellum and the dark antennae. BEHAVIOUR: Usually seen alone resting on sunny foliage but can occasionally be seen in small groups. DISTRIBUTION: Widespread but with a scattered distribution with many obvious areas void of this insect altogether. HABITAT: Wet woodland edges and glades, riversides, wet meadows, fens, marshland and coastal areas. PERIOD: May to August with a peak during July. Never abundant in any one area.